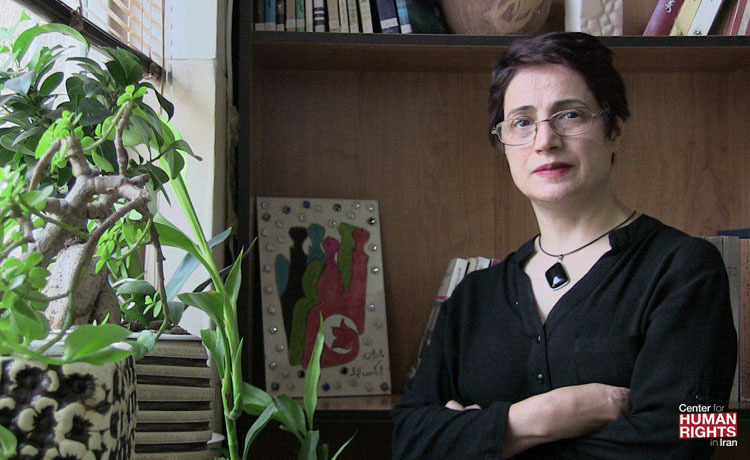 Nasrin Sotoudeh's Lawyer: "They Came After Her From Three Directions"
Prominent Iranian human rights attorney Nasrin Sotoudeh, who has been detained in Evin Prison under national security charges since June 13, 2018, is facing five-year prison sentence and three other charges. Iranian human rights lawyer Nasrin Sotoudeh once defended political prisoners but she is now trying to avoid becoming one herself as she wades through the complicated case Iran's judiciary has built against her. Sotoudeh was caught off guard when she was suddenly transported from her home to Evin Prison in Tehran on June 13, 2018. Later she was informed that she was detained due to a five-year prison sentence that was issued against her in absentia in 2015 by Revolutionary Court Judge Mohammad Moghiseh. That sentence was for the charge of "espionage in hiding" but according to her lawyer, the charge was never in the indictment and the sentence exceeded the maximum amount allowed under Iranian law. "The indictment mentions two charges: 'propaganda against the state' and 'forming groups against national security.' But Judge Moghiseh issued a five-year sentence for 'espionage in hiding' based on Article 510 even though that charge essentially didn't exist in the indictment," Sotoudeh's lawyer Payam Derafshan told the Center for Human Rights in Iran (CHRI) on August 15, 2018. According to Article 510 of Iran's Islamic Penal Code, "Anyone who, with the intent to disrupt national security or aid the enemy, recognizes and hides, or assists in hiding spies who have a mission to gather information or cause damage to the country, shall be sentenced to six months to three years' imprisonment." Derafshan told CHRI that when the sentence was issued in 2015, Sotoudeh's lawyer, Mahmoud Behzadirad, immediately objected that it was inconsistent with the indictment. The judiciary's sentencing compliance office agreed and in a letter to Judge Moghiseh, asked him to correct the sentence or provide an explanation. "But without offering any legal reasoning, Mr. Moghiseh only wrote this sentence: 'That is the court's decision,'" said Derafshan. "They filed the case away so that they could use it to jail her someday, or else they would have carried out the sentence that same year." The attorney continued: "Sometime later, Ms. Sotoudeh was summoned by Branch 7 of the court in Evin and was told that she was facing another case for [the charges of] 'insulting the supreme leader' and 'propaganda against the state' based on a complaint by a prosecutor in Kashan, in connection with the arrest of Shaparak Shajarizadeh. "She was only informed of those two charges," he added. "It's not clear if there were other charges as well." "Then she was issued bail set at 650 million tomans ($154,000 USD) but Ms. Sotoudeh rejected it on the basis that it was unreasonable," Derafshan said. "Even if she had paid the amount, it was not clear she could have been released since she was given a five-year sentence in absentia in the other case." But Iran's judiciary had not stopped there. "A few days later, she was summoned to Branch 2 of the court in Evin," Derafshan said. "This time she was informed of charges for forming Legam and the assistant prosecutor issued a warrant for her arrest. In other words, they came after Ms. Sotoudeh from three directions." Legam is a banned Iranian organization that opposes the death penalty. She is currently awaiting the appeal result of the five-year prison sentence she was issued in absentia in 2015 for the charge of "espionage in hiding." She is also facing three other charges in connection with her legal defense of a woman who took off her headscarf in public and for participating in the formation of Legam: "insulting the supreme leader," "propaganda against the state" and "assembly and collusion against national security." Sentenced to Prison Based on a "Suspicion, Not a Certainty"
Sotoudeh's husband Reza Khandan questioned how his wife could be convicted based on a judge's suspicion rather than actual evidence. "The reason given for this  charge is her meeting with foreign diplomats suspected of links with intelligence officers," he told CHRI on August 15. "My question is, how can someone be condemned to five years in prison based on a suspicion, not a certainty, and why haven't those suspected diplomats been expelled and ties with them been severed?" Khandan added: "If meetings with diplomats are evidence of spying, that would be the end of international relations. A few days ago, [Supreme Leader Ali Khamenei's foreign affairs adviser] Mr. [Ali Akbar] Velayati met with [Russian President Vladimir] Putin, who at one time was a KGB officer. [Iranian Foreign Minister] Mr. [Mohammad Javad] Zarif meets with diplomats night and day. Should we now accuse Mr. Zarif of spying?" Sotoudeh was arrested shortly after she joined other lawyers in condemning the Iranian judiciary's decision to force detainees held on politically motivated charges to choose their lawyers from a list of 20 approved by the judiciary. Iran has a documented history of harassing and jailing lawyers who have taken on politically sensitive cases. In 2010, Sotoudeh was sentenced to 11 years in prison for the charges of "acting against national security," "collusion and propaganda against the regime," and "membership in the Defenders of Human Rights Center." An appeals court later reduced her sentence to six years in prison and she was granted early release in September 2013 after serving three years. In July 2018, the International Bar Association's Human Rights Institute (IBAHRI) sent a letter to Iran's Supreme Leader Ali Khamenei calling for Sotoudeh's immediate release.